Happy National Burger Month to you and yours! Seems like a strange greeting to hear from the authors of two vegetarian cookbooks, right? Here at The Chubby Vegetarian, we think veggie burgers are burgers, too. That's right, we said it! Veggie burgers sometimes seem to get a bad rap and, okay, a lot of times, it's for a good reason. The truth is that there are way too many over-processed, mushy, or otherwise unappealing versions of veggie burgers out there. Our aim here is to change that perception. 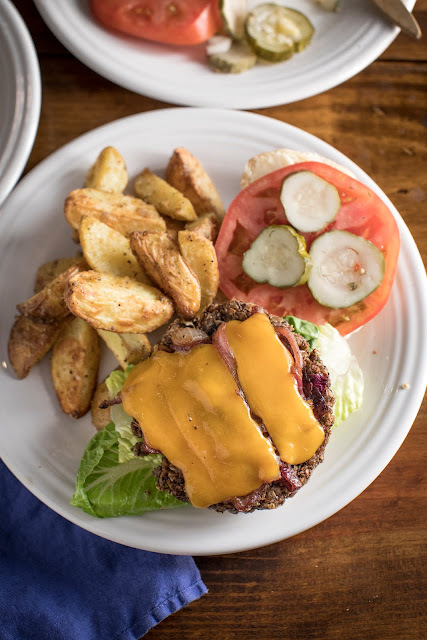 To do that, we knew we had to simplify our go-to recipe, and in turn, make a burger that shines with flavor, has a great texture, won't completely fall apart, and will appeal to just about everyone who's willing to give it a try. This burger is vegan, gluten-free, and has only two main ingredients: mushrooms and rolled oats. It sounds strange, but we've been inching our way toward this recipe for more than a decade. In the past, we could make good veggie burgers that were complicated to make or simple burgers that were a stretch for some (Here's looking at you, sweet potato burger!). This recipe ticks all the boxes and passes the ultimate test: the Amy test. She may not always stick to eating just veggie burgers, but this one, she actually loves and even requests. Into the work bowl of your food processor, place the mushrooms and pulse until they're very finely chopped but not blended. (You may need to work in batches depending on the size of your processor.) Into a large mixing bowl, place the chopped mushrooms and then the salt. Allow mixture to rest for 5 minutes. You'll notice that the water is being pulled from the mushrooms; do not discard that water! To the mixing bowl, add the oats and black pepper. Divide the mixture into 6 equal balls. On a sheet of parchment or wax paper, press each ball into roughly a 4-inch patty. Make sure your patties have smooth, rounded edges because this makes them more structurally sound so they won't fall apart. In a large frying pan over medium heat, add 1 1/2 tablespoons of olive oil. This sounds like a lot of oil to some, but remember, there's no fat in the burger, and a burger needs some fat. Pan-fry the burgers three at a time for about 4 minutes per side. Add the remaining oil before cooking the second batch. 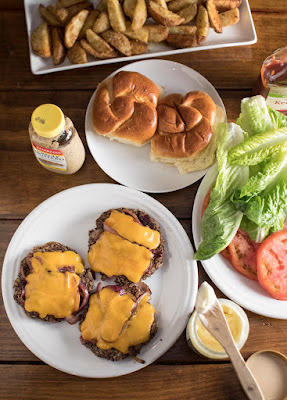 (We love to cover them with sautéed onions and melty cheddar before taking them off the heat, but hey, we all know that building the perfect burger is a very personal endeavor. We won't assume to know exactly how you like it, so you decide the rest. However, we will say a fried egg on top is always an excellent idea. Wow these look great! I often struggle for a really good no-fall-apart burger for my vegetarian friends at BBQs, as the processed/bought ones are lacklustre. This looks so juicy. Will definitely try it. I made these last night. I tried to halve the recipe as it was just for me and my gf. It was definitely going to be too wet a mixture so I added quite a bit of flour when kneading and they turned out really nice. Then it struck me - when you say, having salted and rested the mushrooms, "do not discard that water!" do you mean leave it in the mix or keep it aside and use it for something else - stock, gravy etc?? Anyway, as I said, they turned out really nice! Thanks! I made this for my vegan Foodswap. They were quite tasty but I had to make some important tweaks. The salt in the mushroom mixture was to sweat the mushrooms of liquid, but it was way too much. The liquid, which was to be reserved for another purpose, was almost like brine. And the mushroom mixture was too salty. In subsequent badges I just squeezed the mushrooms with my hands to get rid of the liquid. Also, the size of the oatmeal you buy is important. I bought large old-fashioned oatmeal and had to grind it up in the blender. But if you buy quick cooking small flakes grinding isn't necessary. I made these over the weekend. By far the best vegan burger I have made. The texture and look are SO much like a real burger it fooled my grandchildren. This will be my go-to going forward. I made these exactly as instructed and they were perfect. Dear anonymous, The liquid stays in the mixture. That was where you went wrong. It's super simple! Grind mushrooms, salt, Add oats, cook. Give it another shot. I promise they're just right if you follow the instructions.